deSIGNery Sign Company is a supplier of high quality custom screen-printed and 4 Color Process 2019 keyboard calendars and computer monitors calendars. Screen-printed and 4-color process on pressure-sensitive white vinyl in any of our standard colors. Please specify year when ordering or current year will default. Keyboard & Monitor Calendar Strips are furnished with a slit in the liner. During your work day, you may ask yourself more than once what day of the month it is. Forgetting the date is one of the easiest things to do. Our company has stepped it up and produced a product that is sure to keep you “up to date”. Check out our Spring Sale for savings on Keyboard & Monitor Calendar Strips and 2019 Calendar Strips in the following link. No. 6652 10" x 1 1/8"
No. 6654 11 1/2" x 1 1/8"
No. 6656 13" x 1 1/2"
No. 654 12 1/2" x 1 1/8"
BBB Member since 2004 with a proven record of complaint free customer satisfaction on items like Keyboard & Monitor Calendar Strips and 2019 Calendar Strips. Click on the BBB logo above to check our record or leave a customer review. At deSIGNerySigns.com we have more than 24 years experience in designs for our 2019 Calendar Strips. Call us today and let our design specialists help create your next project to promote your product or business. FREE Shipping on all decal and sticker products | Free layout | A+ BBB rating | 24 years in the business | Call Today for a free quote on 2019 Calendar Strips. 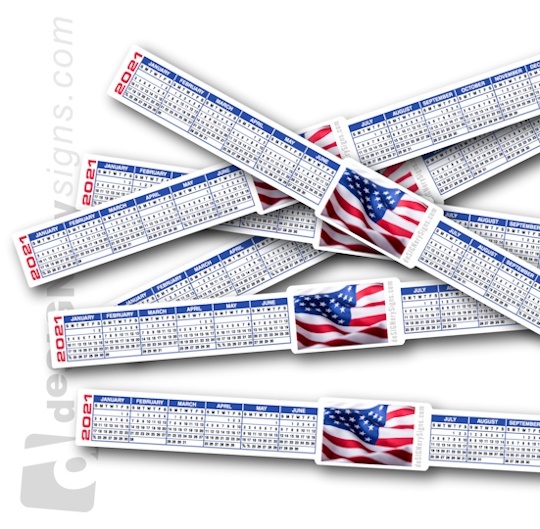 With endless possibilities to making your calendar decal custom, you can be sure that it will be one of a kind. 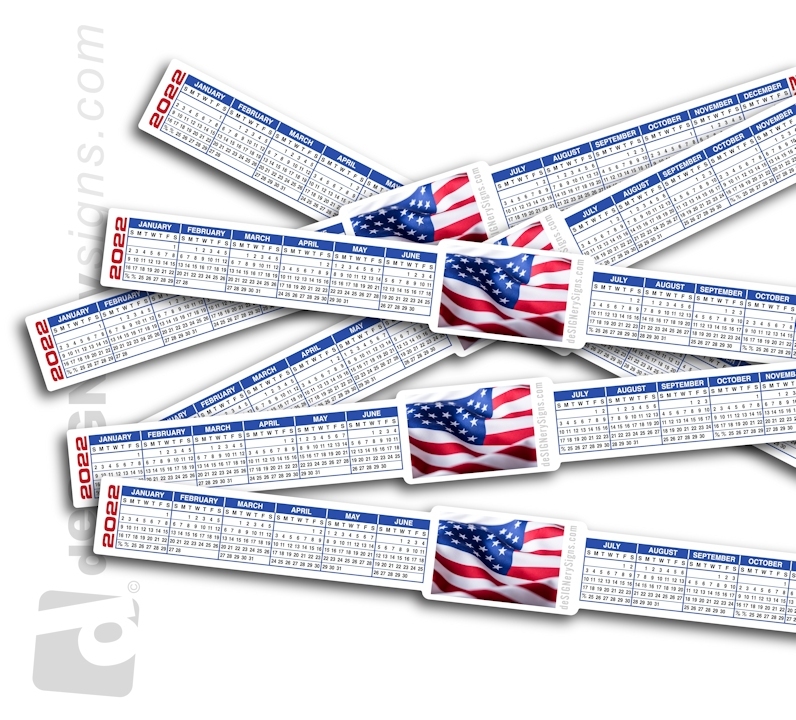 The calendar strips can be easily applied to your computer monitor or keyboard and removed with leaving little to no adhesive behind. Our company offers the 2019 computer calendars strips in a horizontal and vertical layout for monitor calendars, and can also be month specific. This way you can order the calendar in the middle of the year and not waste your money on half of a calendar that you will never use. No one is ever really sure if these 2019 computer calendars will work for their specific type of computer monitor or keyboard. For this reason, our company offers free samples. Visit our Contact Us page for a free sample from our company so you will be sure that these 2019 keyboard calendars will work perfectly for you. Unsure if your logo will work on the calendar strip? Submit your logo file to our talented art department by using our Free Quotes form. deSIGNery Sign Company also offers full-color calendar & schedule magnets, calendar decals, calendar stickers, calendar loyalty & appreciation cards, magnetic and adhesive calendar pads, and picture frame refrigerator magnet calendars. Awesome products to always having your name out in the community. If you have a project in mind that requires a 2019 calendar, call us today! Standard calendars are January - December. Please specify beginning month and year when ordering. 4 standard sizes in horizontal and rectangular layouts are available. These 2019 Calendar Strips will easily peel off at the end of the year leaving no adhesive glue behind on most surfaces.